My sister Helen has kindly modelled my first ever post for me! 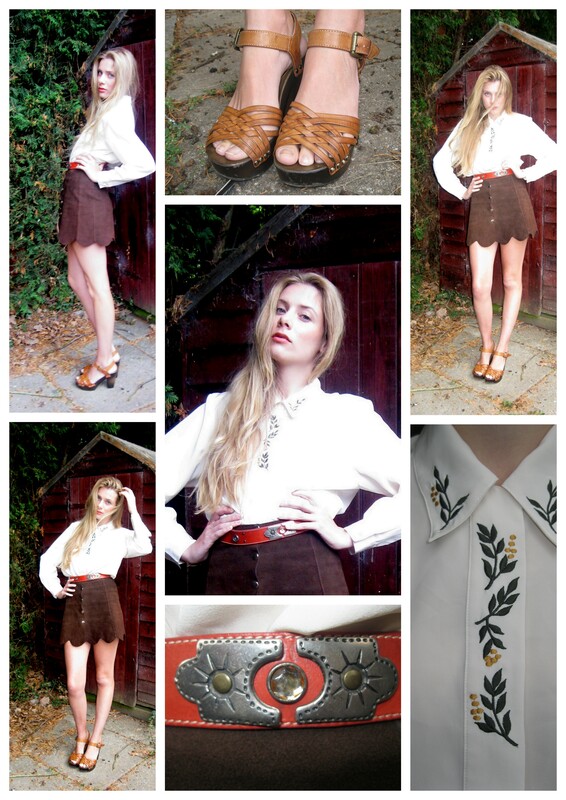 !…At the weekend I styled her in a vintage brown suede skirt, which is very on trend due to it being suede and the scalloped edged hem, with an embroided blouse. Most of my clothing I have sourced from charity shops, as I love that the pieces have had a life and been worn. This blouse I bought from my local charity shop and it was only £2.99 so I HAD to buy it. The look has a late 60′s/70′s vibe to it, probably due to her GORGEOUS long blonde hair! With this blouse a long leather skirt would look great, one that finishes mid-calf, also with a floppy large hat, YSL style!…. I think that the scalloped edge came into fashion due to the 70′s/vintage styles that came into fashion a few seasons ago, the 70′s started with chloe’s A/W 2010-11 collection I think. This collection for me screams 70's, from the beige shades to the turtle necks. 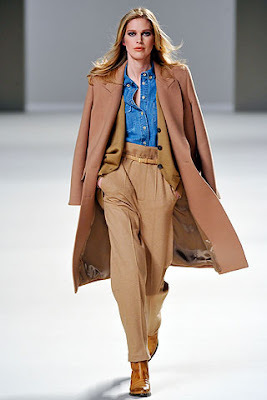 70's silhouettes are prominent still in Fashion, but it's developed into the geek chic/androgynous trends. I currently LOVE the embellished beaded collared shirts paired with high waisted shorts as seen at New York Fashion Week s/s 2012 by Jason Wu. For my Autumn/Winter wardrobe I'm going to try and incorporate this look, but do a smart cashmere jumper over an embroided collared blouse as it still remains that Vintage feel, and will keep my warmer for the chilly months!